by Jing Liu ~ March 30th, 2009. Filed under: Events. I enjoyed my companies to Seattle–Kat and Lorn and admire their energy. The most popular words at the conference were partnership, Liasion and collaboration, including with East Asian counterparts. I wonder if CEAL should collaborate with ACRL in the future besides AAS. I ran into Harry, my first supervisor librarian, in the hallway. He was happy for my progress after UW, and promised a visit this summer to UBC. Another exciting moment was meeting Mindy at her poster, which attracted many people as you can tell from the photo. She gained scholarship from the ACRL, which I heard very competitive. What a start as a baby librarian! 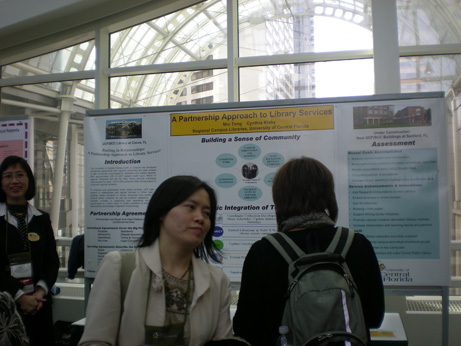 Meeting with you at ACRL was a highlight for me too, Jing. It was so nice to finally see you again after leaving Vancouver almost 2 years ago. The weather and landscaping in Seattle was so much like Vancouver that it made me feel like going back home. Miss you all!! How excited you must be seeing each other in Seattle! This is the time when I am envious of the life of an Academic Librarian.